Please respect the rights of private landowners. 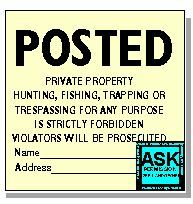 If you enter private property without permission, you may be guilty of trespassing. In New York State, you can be arrested and fined $250! This website does not give you the right to trespass on private property. You must seek your own permission to hike on private property. New York State provides ASK stickers that landowners can add to their posted signs indicating that permission for some purposes may be granted. Please support these landowners by asking rather than assuming. For more information, see The Posting Law, Recreational access and owner liability, and Analysis of Limited Liability Recreation Use Statutes in the Northern Forest States.